42,000 is the number of people who die in car accidents every year, the number of people who have been killed by leftover explosives in Vietnam, and the number of attendees at Obama's Inauguration Ceremony at the Convention Center in Washington, DC. And on November 1 in New York City, 42,000 runners made their way from chilly Staten Island through the rest of the boroughs (Queens, Brooklyn, Bronx) to Manhattan and into full-of-fall-foliage Central Park for the New York City Marathon. And they all passed by my parents' apartment where I was staying while visiting family. I went down to First Ave at 59th Street and wedged myself into the crowd, partly to get warm but partly to get a decent photo. One guy yelled, "we love Paula!" 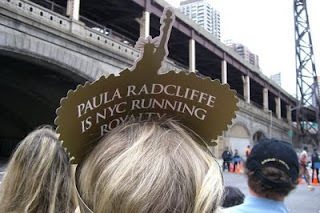 (Paula Radcliffe was the favorite in the women's race) and I asked if he was her biggest fan. He replied that everyone there was her biggest fan today. That's New York for you, excited about everything, waiting 6-deep along a city street to see their favorites, their friends and 40,000 or so other runners. There were flags from many nations, amplified bands playing upbeat music and people dressed up in orange, the color of the sponsor, but also the color of the season. I found a great vantage point from atop a discarded mattress on the sidewalk and tried to steady my camera as a woman near me bounced and swayed to the music. I returned to the apartment in time for lunch and we watched as the stream of runners grew thicker, the middle-of-the-pack runners crowding the lower roadway of the Queensboro Bridge. I could hear screams from the crowd and loud music and I felt a nervous energy that wouldn't allow me to sit still. When my dad announced that he had to go to the wine shop for some Montepulciano, I eagerly volunteered to accompany him, feeling the need to be near the crowd of fans. At seeing the hordes, the blocked streets and the police officers and cars piling up on side streets, my dad panicked over how we were going to be able to leave the city, imagining that all routes north would be blocked while trying to get to my sister's house in Connecticut. Once in the car, we just had to make a few "New Yorker" moves and we were cruising north. That put to bed the marathon for the day, but I caught back up to it via the NY Times' excellent coverage the following day, where they devoted an entire section to the race, from many different perspectives and listed all the 42,000 names of the finishers. 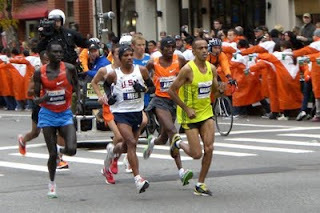 Pictured at right is Meb, the winner of the men's race. Paula, Nike's "Running Royalty", had tendinitis troubles and had a bad day but was treated royally by a fellow competitor and fan and eventual race winner for the women, Derartu Tulu of Ethiopia. 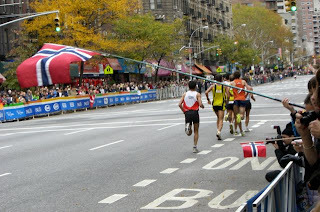 In New York, even the competition cheers on the runners.